Sorry Mom! I know I have totally slacked on getting photos of your Liddy-Bitty on here. Here are a few moments from a couple recent Lydia days, including the one that I blogged about in "My Motherhood Game Plan". Photos AND a video! "Lydia Day is a day I focus totally on doing things that I know Lydia loves to do. Our last Lydia Day was this past Wednesday. My husband went in to work a little late so that he could spend breakfast with Lydia. While they ate, I went outside and set up a little surprise. Lydia has been asking everyday to go pick strawberries like we did a month ago. Unfortunately, strawberry season is over. Instead, I scattered a pint of strawberries throughout our backyard. Lydia was so excited to get to “pick strawberries” and then eat them with mommy on a blanket in the sun. 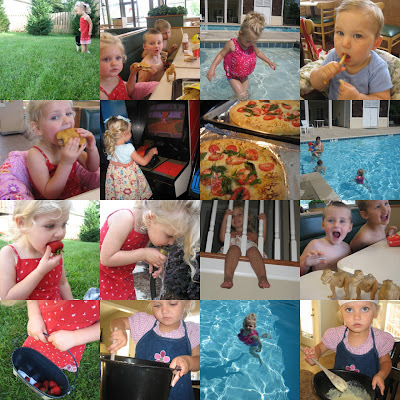 Next we went swimming with friends, then out to hamburgers at her favorite restaurant. I even sat down and watched a new cartoon with her (instead of running off to empty the dishwasher or check my email). She was in heaven. To be honest, so was I. Spending such a concentrated amount of time with her reminds me how fun being a mom can be. A day of no housework isn’t too bad either." ♡ She is so cute! Oh I love you Natalie. You were such a good big sister growing up; it's so nice seeing those qualities have only been strengthened by motherhood. ...real motherhood, not the kind where you pretend to have two much-too-old-to-your-children, named Aspen and Rhapsody. How precious is that! You really have a sweet little girl. I clearly believe like mother like daughter. You seem to have a sweet disposition yourself. hey there...you have been tagged. go to my blog to see. You have to share it with 7 others and you must accept your award academy style! Happy Day! Now that is too awesome for words - what a beautiful day you created. She'll have those memories with her forever.